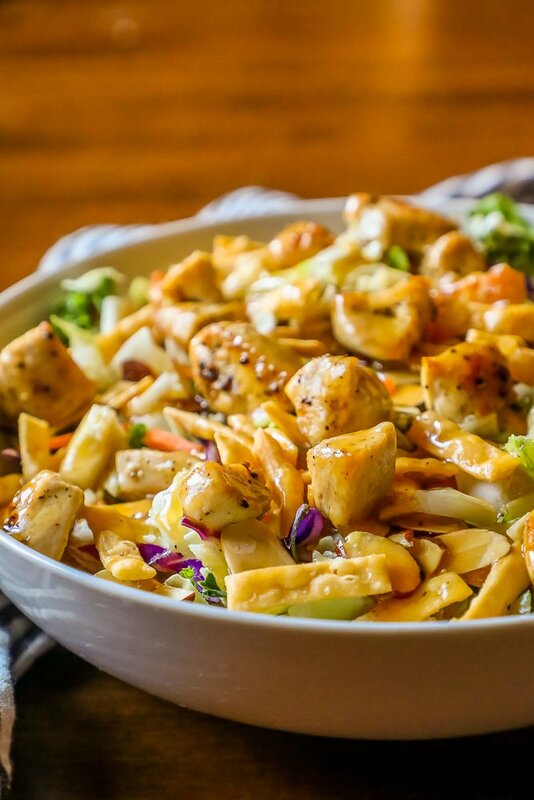 The Best Chopped Chinese Chicken Salad Recipe – a delicious, hearty salad bursting with Asian chicken flavor that the whole family will love. 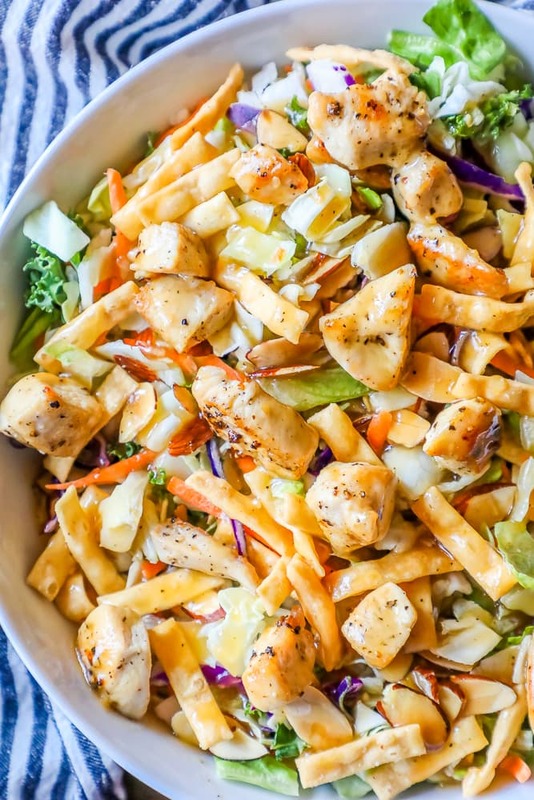 Chinese Chopped Chicken Salad is one of my all time favorite dishes – it is crisp, crunchy, cooling – and packed with tons of flavor. I love salty, slightly sweet, and crunchy Asian-inspired salads – and this Chopped Chinese Chicken Salad is one of my all time favorite meals ever. One note: While this salad is definitely inspired by Chinese Chicken flavors, it is in no way an authentic Chinese dish – but since I see it most often on menus as a Chinese Chicken salad, I’m just sticking with the name 😉 . If you’d like to skip my helpful tips and tricks to making the most delicious Chopped Chinese Chicken Salad recipe, please scroll to the bottom (just before comments) where you will find the easy printable recipe. This salad is one of my all time favorites because it is so incredibly versatile. If you don’t love an ingredient as listed, go ahead and swap it for something you like more! 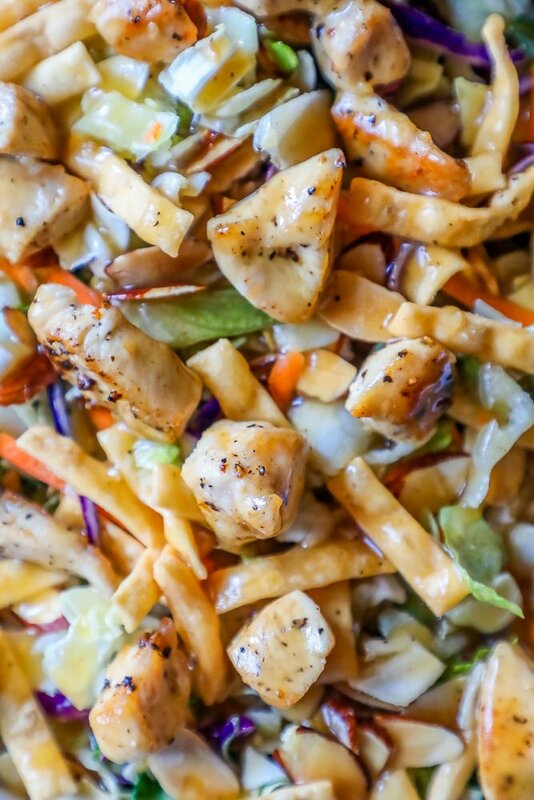 If you loved this easy Chinese Chopped Chicken Salad Recipe, be sure to check out some of my other favorite salads! 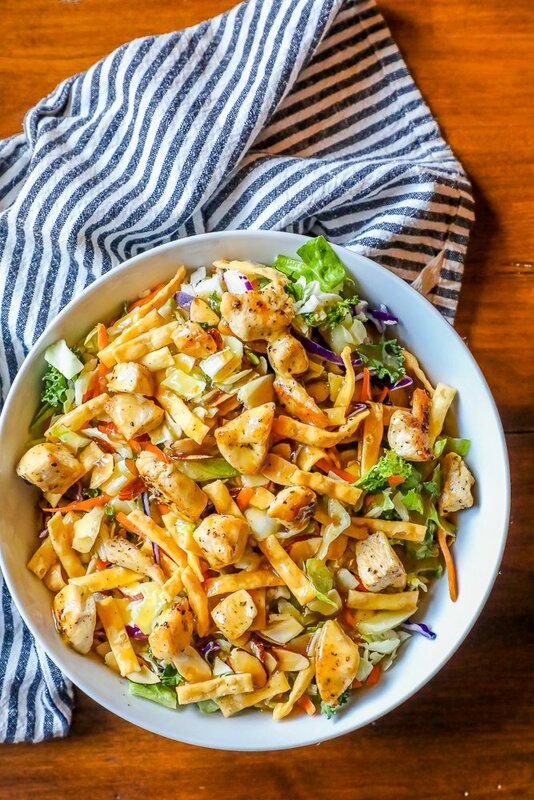 If you love the Best Chopped Chinese Chicken Salad Recipe as much as I do, please give it a five star review and help me share on facebook and pinterest! 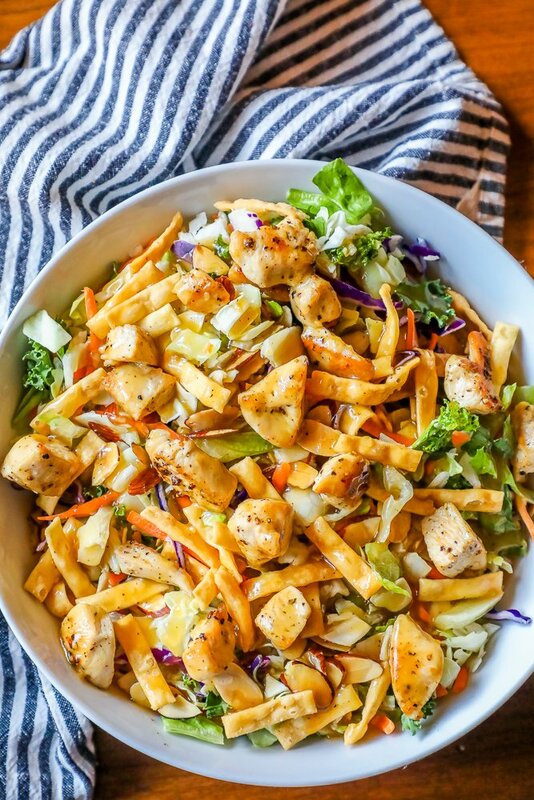 The Best Chopped Chinese Chicken Salad Recipe - a delicious, hearty salad bursting with Asian chicken flavor that the whole family will love. In a small jar with a tight-fitting lid, combine oil, vinegar, hoisin sauce, soy sauce, ginger, and sesame oil. Shake vigorously until combined. Allow flavors to blend at room temperature while preparing the rest of the salad. Or, refrigerate for up to 4 days. In a large bowl, combine the chicken, cabbage, carrots, scallions, and cilantro. Shake the dressing to recombine and pour over the salad. This salad is so flavorful! I love the dressing! This is one of my favorite salads to order when we eat out. I can’t wait to try it at home. Your version looks simply scrumptious!! This looks just like one of my favorite restaurant salads! I HAVE to try your recipe! This salad is a must on our weekly menu! So tasty! Gosh does this look so good and healthy! I’m for sure going to make this, the dressing looks awesome!